Jason Meara take MX2 Experts overall at Sherwood. Local riders shone at round four of the Michelin MX Nationals British Championship at Sherwood MX circuit last weekend. Jason Meara taking maximum points in the MX2 Experts class winning four races from four starts on the Watt KTM while Dundonald schoolboy Ryan Mawhinney stretched his lead in the open BW85cc class with three wins from four starts on the Hitachi KTM. Ryan Mawhinney wins at Sherwood. In blazing sunshine Meara set pole and dominated the Experts MX2 class to increase his championship lead to 81 points clear over Ben Clarke. In his opening race on Saturday he battled from second to last to beat Charlie Putnam by just 0.649 seconds at the flag with Ben Clark third but that was as close as anyone got the the local flier as he demolished the opposition in race two after taking the lead early on to win by over 12 seconds from Joe Cadwallader. In Sunday’s two motos he simply was in a class of his own winning by over 19 seconds in his opening race from Clark then 25 seconds clear of his nearest rival Putnam in race four. 15-year-old Belfast schoolboy Ryan Wawhinney opened the gap at the top of the BW85cc Championship to 28points over his nearest rival Jack Grayshon after taking his ninth race win of the season on the Hitachi KTM. If it hadn’t of been for a bad start in race three the Dundonald High School pupil would have won all four of his races at Sherwood. “I had a great weekends racing taking three wins and the overall,” said Ryan. “I made a bad start in race three but was working my way through the field and was up to third when the red flags came out. Lisburn’s Richard Bird still leads overall winner at Sherwood Brad Cavill by 64 points in the MX1 Experts championship after taking the Five-5 Motorsport KTM to third overall but it was Loughbrickland’s Watt Kawasaki rider John Meara, having his first outing of the year in the MX Nationals, who got the better off his rival taking second overall. Meara said: “The heat was crazy and I struggled massively with it as it’s something I’m not used to. Also I haven’t done two consecutive days riding in two years, so it was a tough weekend. Local interest in the MX2 Pro class focused on Martin Barr and Glenn McCormick. Revo Husqvarna rider Barr qualified second fastest and in his opening race finished second behind Buildbase Honda’s Josh Gilbert with sixth place qualifier McCormick on the Watt KTM taking ninth. In race two Barr retired on lap nine but McCormick finished eighth. Barr said: “I made an ok start in race one but got stuck behind some of the 450s and by the time I got past them Josh (Gilbert) was too far in front to do anything about. “Then in the second moto I made a better start but was out dragged up the hill lying third MX2 on the opening lap. I had a couple of big moments with a front tyre problem and decided to use my head and pull in. Reigning MX2 Experts champion Glenn McCormick was reasonably happy with MX2 Pro performances. 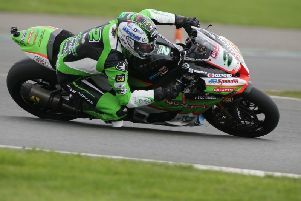 “I was sixth in qualifying and got up to seventh in the opening race but the heat hit me hard in the latter stages of the race and I dropped to ninth by the flag,” he said. “In race two I made an awful lot better start lying inside the top six on the opening lap but I got dirt in my eye and couldn’t see dropping back to eighth at the finish. Elliott Banks-Browne took the Geartec Husqvarna to the overall in the MX1 Pro class with two clear wins.